FREE Luxury Wash Bag when you spend £55. 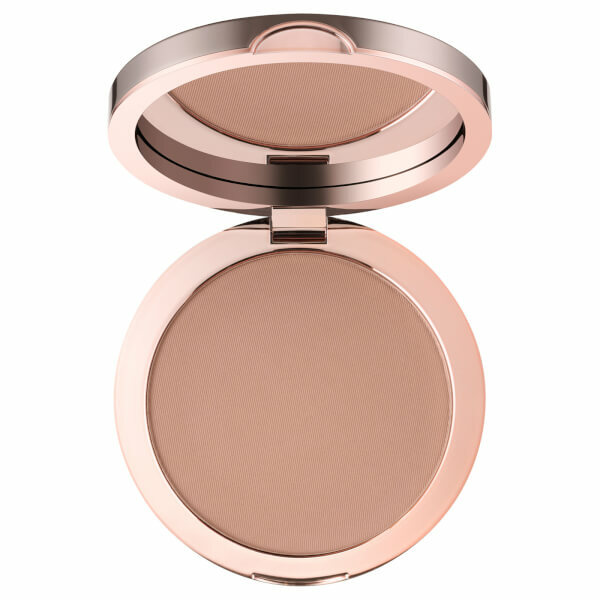 The Sunset Matt Bronzer from delilah is a completely matte powder that instantly adds a sun-kissed radiance to any complexion. The silk-textured formula glides onto skin with a subtle, natural-looking pigmentation that evenly blends, with soft-focus pigments helping to diffuse the look of imperfections. Enriched with Vitamin E, the luxurious bronzing powder leaves skin with a healthy tone, with Jojoba Oil adding moisture to avoid settling or cakiness. Housed in a chic, mirrored compact. Dermatologically Tested. Free from parabens. Use the delilah Bronzer Brush to apply Sunset Matte Bronzer. Start by applying to the tops of the cheekbones, the forehead, down the bridge of the nose and the tip of the chin. Remember to dust a little over the jaw line and neck. Blend well with the Bronzer Brush. Talc, Mica, Nylon-12, Silica, Magnesium Stearate, Dimethicone, Zinc Stearate, Polyester-4, Cetearyl Ethylhexanoate, 1,2-Hexanediol, Caprylyl Glycol, Octyldodecyl Stearoyl Stearate, Pentaerythrityl Tetraisostearate, Simmondsia Chinensis Seed Oil, Tocopheryl Acetate, Trimethyloxysilicate, CI 77491, CI 77492, CI 77499.